James C. Roberts wrote in The Washington Post about heroes who should be wearing the Medal of Honor around their necks. The fact that not a single living Iraq War veteran has received the Medal of Honor is a serious injustice to the 1.5 million Americans who served in that conflict. This story brought to mind the fact our National Media stations, calling their programs "news" need a refresher on what they used to find important enough to cover. The one group, who represent what can be achieved when people work together, are those who risk their lives side by side no matter what. Would be great if the news stations would remember that when all they want to cover is political divisions in this country. When you read about Marine Sgt. Maj. Bradley A. Kasal, you'll wish you saw the report on your news station. "Emblematic is the story of Marine Sgt. Maj. Bradley A. Kasal. On Nov. 13, 2004, then-1st Sgt. 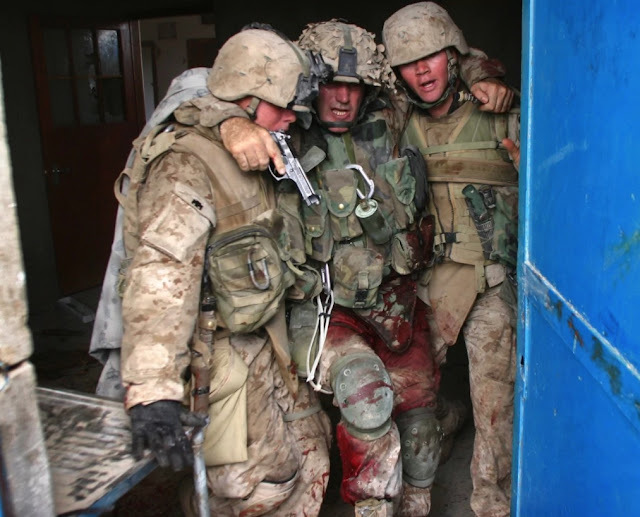 Kasal entered an enemy-occupied building in Fallujah, a death trap our troops had dubbed “Hell House,” to assist fellow Marines who were pinned down by a superior enemy force. Under withering fire, Kasal killed an insurgent immediately; then, while dragging a wounded Marine to safety, he was struck with seven rounds of small-arms fire. Severely wounded, Kasal used the few bandages he had to treat his injured comrade rather than himself." Mr. Roberts, thank you for telling this story. I saw this picture a long time ago and always wondered what happened to him.